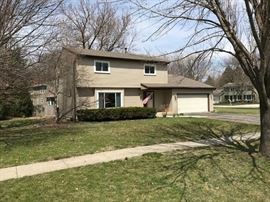 AddressThe address for this sale in Naperville, IL 60563 will be available after 9:00am on Wednesday, May 8th, 2019. 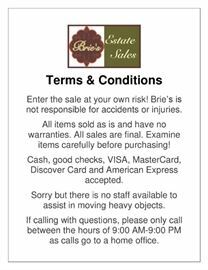 All items sold as is. All sales are final. 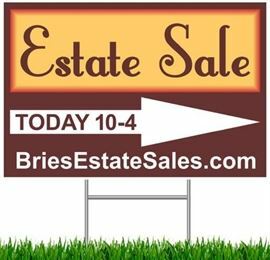 Cash, good checks, VISA, MasterCard, Discover Card and American Express accepted. Sorry but there is no staff available to assist in moving heavy objects. Not responsible for accidents or injuries. Numbers at 9:30 AM Thursday. We will honor a handwritten list of names compiled prior to 9:30 AM Thursday morning, however we are not responsible for monitoring the list. We will call off the names and pass out the first round of numbers from a single list which will be affixed to the front door of the home. If calling with questions, please only call between the hours of 9:00 AM-9:00 PM as calls go to a home office.